Here are some basic Momir rules and strategies for a five-win victory in MTG Arena. Wizards of the Coast is keeping the MTG Arena format healthy and fun with a variety of featured events. Beginning April 19, the Momir event returns to MTG Arena. Momir is a wild event full of randomness and strategy that hasn’t been seen since the fall of 2018. The rules for Momir are simple. It doesn’t require a deck, and creatures are chosen randomly from the MTG Arena pool based on their mana cost. All creatures are token cards. Once it dies, it’s gone for good. Creature tokens will be chosen based on the type of land a player puts into the battlefield. Due to the discard effect, you’ll always be throwing away a land. Players must discard wisely to ensure having all colors represented. 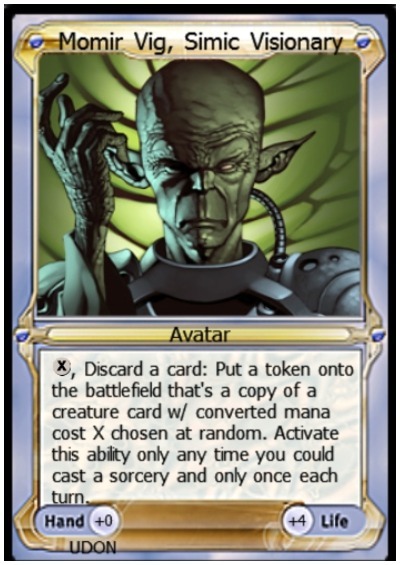 A player will also have the right to pass on a Momir token and tap lands for creature abilities instead. Because the creature is a token, cards with returning from graveyard abilities won’t apply. Once the creature is killed, it’s permanently dead. In addition, there aren’t any sorcery or instant cards. 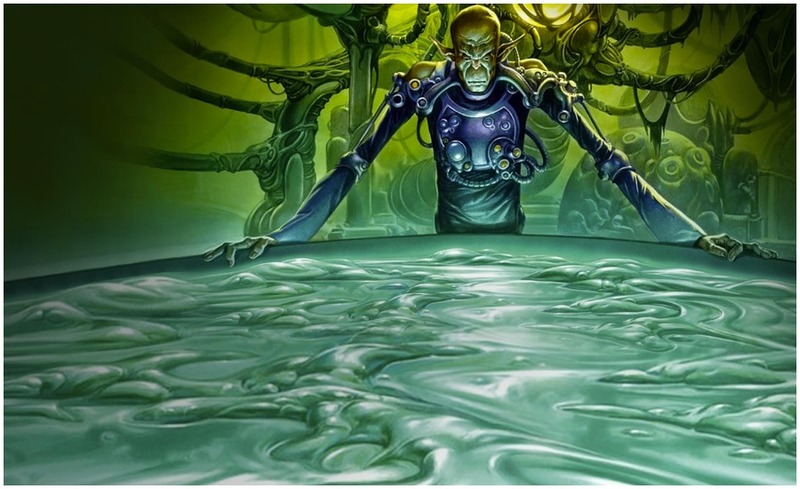 The Momir basic event might seem like random insanity, but there’s a strategy for this madness. Magic: The Gathering is a game that relies on dropping creatures and spells on the correct turn. In Momir, this still applies, since some creature tokens will have mana abilities. Some will provide land ramp or counters, while others can destroy or steal another creature. Some turns aren’t worth dropping a Momir token creature. A one drop will likely give a player a 1/1 token, but it also means discarding a land. Unless that first creature token has an ability, it won’t be of much use. In a Momir event, the goal is to get lands on the board for bigger and more devastating creature tokens. Two drops, however, are important not to pass up on. Many of these creatures have abilities, like Druid of the Cowl and Incubation Druid, which have mana acceleration abilities. Three drops can go either way, but four is predominately a go. Getting a creature token on the third turn will greatly depend on what a player received on turn two. Turns six and eight are decent, but it’s on turn nine where a player never wants to pass on a Momir creature token. By not discarding a land every turn, or by drawing a creature with mana acceleration, a player can get to their nine drop token (Zacama) faster than their opponent. 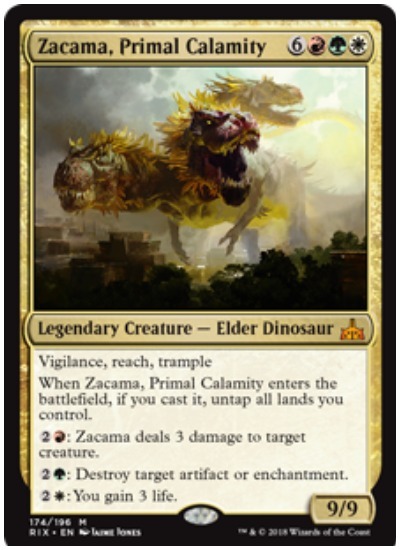 Zacama, Primal Calamity is a nine mana (one red, one green, and one white) legendary dinosaur from the Rivals of Ixlan expansion. The elder is a nine/nine creature with vigilance, reach, and trample. Zacama also has additional abilities. For three mana (one red) Zacama deals three damage to a target creature. Three mana (one green) will destroy an artifact, and three mana (one white) gains a player three life. Zacama, Primal Calamity is a bomb. This elder dinosaur, however, will only be available in MTG Arena until the fall of 2019. When putting lands onto the battlefield, certain colors are better than others. Red, green, and blue contain the most creature cards with relevant activated abilities (red being the highest). White is the lowest, with black slightly ahead of white. Red, for example, has Captivating Crew. It’s a four mana (one red) with an ability to take control of an opponent’s creature until the end of a turn. Azor, the Lawbringer is a powerful flying six drop creature with a nasty activated ability. Azor’s activated ability cost X, one white, and two blue to cast. The player then gains X life and draws X cards (X equals the amount of lands a player chooses to tap). Be smart about using activated abilities and pay attention to what your opponent has on the battlefield. Doing damage, drawing cards, or gaining life might not always be the best option. Pay attention to what mana drop you’re on and calculate your options wisely. The Momir event on MTG Arena is unlike any other format in Magic: The Gathering. There’s no deck needed, and much of what will happen on the battlefield depends on luck and strategy. Winning Momir mostly comes down to dropping creature tokens on the right turns. Watch your lands and don’t jump out of the gate too fast. Use cards with activated abilities to gain an advantage while using land accelerator cards to drop those bigger creatures. Research all available cards and activation abilities on Wizards of the Coast MTG Arena card list. Most of all, have fun. The Momir event in MTG Arena shouldn’t be taken too seriously. It’s a format of chance and strategy meant to liven play up. After all, multiple formats are what makes Magic: The Gathering so much fun in the first place.